There is a term used in the optimisation industry- “content is king”. This is very true. SE’s (Search engines) love content, especially regularly updated content. With this in mind, you must remember that “links are queen”. Having inbound links to your website is a very important factor of the SE’ s algorithms, if you want to increase your visibility on SE’s then you must increase the amount and quality of the links that point to your website. For many small to medium companies the cost of paying for a full time link building campaign is far too expensive. Companies, webmasters and web site owners should be constantly trying to improve link popularity (inbound links to their website), an increase in inbound links will cause an increase in visibility on the SERP’s (search engine results pages). The times of “a link is a link” have however passed. Reciprocal links should only be arranged with websites that are about the same topic or share similar content. Websites that reciprocate links with websites that are not similar are deemed as artificially trying to increase link popularity by the SE’s. 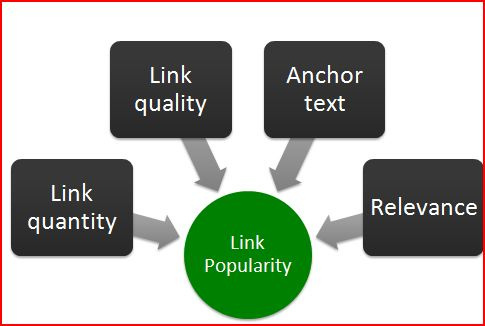 One way inbound links are more valuable than reciprocals, and remember that it is the quality of links that also bears more weight. One link from an authoritative site with high PR (Page Rank) is worth many links from that friend of yours that just built his personal website! Anchor text- This is the word or words that are used to link to your website. e.g. “seo consultant ” is anchor text that actually points to my home page www.goyam.com. This is often called the links “title”. Use the keywords that you would like a high ranking for as the anchor text. For instance Smith LTD sell widgets of all shapes and sizes. They would like to rank well for the term “plastic widgets”. They start submitting their website for inclusion in free web directories. When asked for the anchor text or links title during submission it would be far more beneficial to use the text “plastic widgets” rather than Smith LTD.
With all this in mind you should start your link building campaign as soon as possible? Google will spider links to your website several times before accepting their importance, this process is known as “waiting for the links to mature”. This can often take several months. So, here are my top 10 ways to get inbound links to your website. 1) Submit your website to free web directories. (Make sure you submit to the right category). One of the most important free web directories to submit to is www.dmoz.org (the open directory) DMOZ is used by Google for all of the contents of their Web Directory. Many SE’s and directories also use DMOZ results for their directories. Google also gives a link to your site from DMOZ a lot of credit. Beware DMOZ is edited by humans and getting listed can take anywhere from 1-18 months, so the sooner you do it the better! 2) Submit your website to premium & paid web directories. (Make sure you submit to the right category). 3) Request website visitors link to your site. 4) Write and distribute articles. Write articles about your product & related services then submit them to article distribution websites. This is a very effective way of getting inbound links. The idea is you place a link to your website at the bottom of each article, then when webmasters use your article as free content for their website they must include the link at the bottom of the article. 5) Exchange links with other similar websites (reciprocal linking). Many forums allow you to place a signature at the bottom of every post. Place a link to your website with the use of anchor text and gain a link for every post you make. Also you may post links to your website in the main topic part of the forum. Do not spam though- Only post links when it is appropriate. It is better to be a good contributor to a forum than spam the forum with un relevant links. Create an informative blog about your product or services. “Bloggers” are linking fanatics. Get other “bloggers” to link/reciprocal link to your blog and then place links from the blog to your website. 8) Answer questions in Q+A websites. Some websites allow you to buy links from their website for a specific length of time. is to increase a websites Page Rank. 10) Develop an easy to link to, informative site. All the factors now encompassed in the world of search engine optimisation are both varied and simple, however time and time again website owners fail to see some of the most recent 'common sense principles' behind an effective and successful SEO strategy. This article aims to bring to light the most recent change in SEO, GEO-Targeting. There are a countless number of directories, information portals, articles, FAQ's, Top 10 listings, and other resources that repeat each other about the most important factors of SEO and it's benefits. Many of them however fail to explain some of the more recent changes in the 'formula' of successful optimisation. It has long been the case that users will open a search engine, search for a product or service e.g. "Office Furniture" and make use of that company to make their purchase or gain information. Over the past few years' consumers and businesses have started to make many more purchases directly online, as the general attitude towards online transactions has changed quite significantly. As the consumers and businesses have begun to accept making a purchase online as a normal course of action, the places that they look for these products and services has started to come under consideration. If a company wants to purchase some office furniture they will no long simply search for "Office Furniture". Why? Because the term is too broad, brings up many irrelevant results and often the companies listed are not in the same geographic region as the company looking for the furniture. When searching for products that are going to be purchased online, the customer ideally wants to be dealing with a 'local' company or business. This helps them feel more 'secure' in making the purchase as they know that the supplier is covered by the same laws, easier (and sometimes cheaper) to communicate with, and other factors such as delivery costs and language barriers are far more manageable, making the entire purchasing experience more streamlined. It is during these searches that geo-targeting comes in as a factor of the search. If a customer is looking to buy office furniture and they are located in the USA, it is very common for them to append 'USA' to their search, so instead of looking simply for "office furniture" they will search for "office furniture USA" or a similar variation on this. The effect of this is that the search engine results returned with be mostly UK based as 'UK' is a term used within the sites on their contact details, delivery information pages, legal disclaimer, and often company description pages. Geo-targeted searching is the act of refining your search by including the name of a location within the search term. Examples would be "office furniture UK", "jewellers in Berkshire", "UK Office Supplies" etc. Why use geo-targeting in SEO? As explained earlier, users are changing the way that they search for information to find results close to their location. Many sites that are currently indexed do not really have a large amount of information to help search engines deem them 'relevant' to the appended location term, often because they simply don't have their intended geographic area for marketing mentioned on their site enough. By including the intended geographic market in the keywords used with an SEO campaign and the optimisation performed on a site, it is possible to have a dramatic and successful increase in both top results, traffic to your website, and indeed potential customers finding your products. It is very simple to include geo-targeted terms and phrases within the normal action of search engine optimisation and will go a long way to increasing the revenue a website can generate for it's owner. There must be something bad about doing this? Alienation of potential customers is always possible. If a user in the US is searching for simply "Office Furniture" and your website happened to show up with "UK Office Furniture" in it's title, it is more than likely that the searcher will skip visiting the website because it states that it is targeting the UK. This can be seen as a positive in the sense that it actually has had the effect of qualifying your traffic even more. It just successfully stopped a user visiting your website that would have found out that your products are UK specific and that they could not purchase their requirements from your website anyway. Of course this could also be a negative. If you 'mainly' target the UK but indeed sell to overseas clients this may have just lost a potential sale. This brings us to an important decision. Should geo-targeting be used in an SEO campaign? The answer depends solely on the target audience or geographic region of the products and services provided. Should your product be for a specific area or country, or you tend to only deal with local businesses then yes, you should certainly look to be geo-targeting your optimisation to increase your sales. The second situation is that some of your products or services are available to many areas while others are not. In this instance simply use selective geo-targeted optimisation within each of the products or services sections. Lastly, if your target market is not constrained by geographic regions and is available anywhere, such as online services or products that have worldwide delivery, then more than likely geo targeted optimisation is not an option. Of course, it could be that producing several "global market" sites that are tailored for your most prominent geographic regions could help improve sales as each of these additional sites can be optimised with geo-targeting separately. The key is that geo-targeting an SEO campaign can make a tremendous difference to all factors of a websites success. It is simply a case of deciding if it is a viable option for the products and services the website provides.